Well, I didn't make midnight because I had a full day at my girlfriend's house, and I spent a vast majority of the day on a wii fit. Man, I will never ever make fun of yoga again. 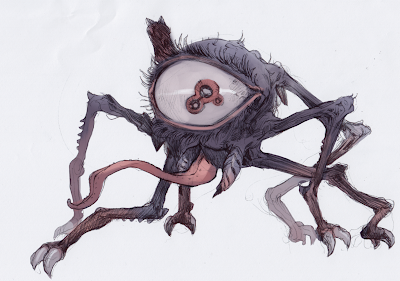 So, this is a eyeball spider thing. It came about because when I went over to her house her little sister was doing a project for a contest and she had to draw some eyes. And she made the comment that some of them were just looking hairy once the eyelashes were em. So I made a hairy eyeball, and added legs for good measure in a quick pen sketch while I was sitting with them. Color job is a bit rushed but eh, I still like it.